A $79.99 coupon for producerplanet.com valid for the ACID Loop Collections: "Pretty in Pop", "Radio Rock", "Modern Waveforms", "This is EDM" and "DJ Puzzle - Urban Vibes" (commercial license for unlimited use of the content in commercial projects is available for purchase). 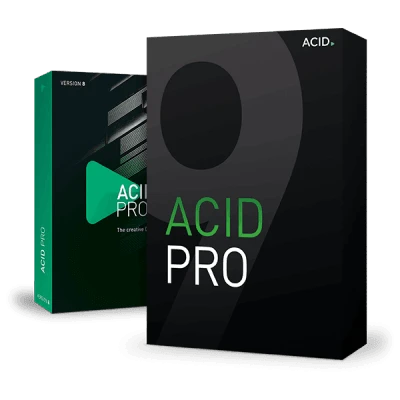 Buy ACID Pro 8 today and get a free upgrade to version 9! The new ACID Pro is coming soon and is scheduled to be released in early May 2019. Now's your chance for double the innovation. Buy ACID Pro 8 today and when ACID Pro 9 is released, you'll get it for free. This is an exclusive 2-for-1 offer! ACID Pro 9 will be released in May 2019. How and when do I get my new ACID Pro 9? When the new version 9 is released in May, you will receive an email with your serial number and instructions for downloading. Please keep an eye on your spam folder around this time to make sure you don't miss the email. ACID Pro 8 is the creative DAW for every type of music producer. Behind its slick new interface lies a powerful, 64-bit music production powerhouse. It combines ACID's famous easy-to-use workflow with pro-level features, over $1,000 worth of new instruments, loops and effects and 9 GB of brand new ACIDized loops. ACID is world-renowned with over 20 years of history in the industry and it will be making even more history with VST3 support coming soon in a free update. ACID Pro 8 is the creative DAW for today's creative artists. ACID Pro 8 is a powerful 64-bit DAW that features ACID's famous innovative audio looping technology, powerful multitrack recording and hi-end audio and MIDI features - all set within an easy-to-use interface to help artists of all levels bring their musical aspirations into reality. Version 8 introduces a brand new GUI but the same famous workflow, creating an immensely powerful and creative music production environment: 64-bit processing, no less than 16 new instruments, 13 new effect plug-ins and 9 GB of new ACIDized loops. Plus, VST3 support is coming soon in a free update giving you access to thousands of third party plug-ins. Take advantage of all the power of your 64-bit operating system. Create complex projects with tons of loops, demanding plug-ins and lots of tracks and real-time effects – more power for your music. Inspired to inspire! The completely refreshed user interface is designed for the special needs of musicians. Precise mixing, creative composing or professional recording – all at lightning speed. More instruments. More sounds. More effects. An incredible suite of 16 instruments, including the DN-e1 analogue synth and Vita Sampler and 13 stunning effects, from the Analogue Modelling Suite to Vandal guitar effects. Plus, get 9 GB of new ACIDized content and free VST3 support (coming soon)! ACID Pro 8 is the DAW that marries professional features with a legendary and inspiring loop-based environment to help turn all of your creative visions into reality. With its slick new interface and powerful 64-bit architecture, you’ll be composing, mixing and remixing faster than ever before. More than 20 years ago, ACID defined and created innovative loop-based music creation. ACID Pro 8 refines this concept further by adding even more creative tools, instruments and effects. It's a 64-bit powerhouse of a DAW ready for a new generation of creative artists and musicians. It's time to experience a DAW with unparalleled MIDI sequencing and loop-based music creation features: ACID Pro 8! It's a DAW with more instruments and effects than ever before, the same easy workflow that ACID is famous for, superb remixing features and free VST3 support (coming soon). It’s the DAW for creating your musical dreams. Experience unparalleled MIDI sequencing in ACID Pro, with real time MIDI processing and precise control over MIDI events. Use track envelopes to automate and modify modulation, expression, or other types of MIDI controller data. ACID Pro supports control surface automation and channel tracking for devices such as the Mackie Control and Frontier Design TranzPort. Its unique Beatmapper tool makes remixing easy, and the Chopper tool helps you create impressive drum fills, stutters, and DJ effects. Keep up to date. All of the time. 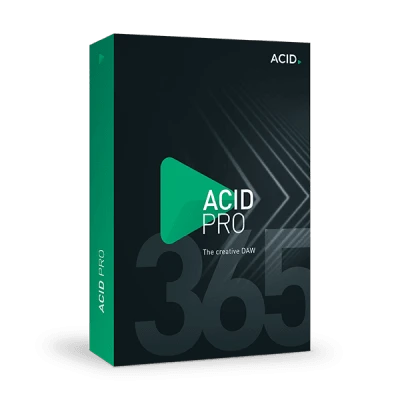 ACID Pro 365 is the all-new way to enjoy ACID Pro for a low monthly fee. You will stay completely up to date with the software as you'll get all the new features, instruments, patches, effects and more as soon as they are released. Interact with other ACID users and discuss the latest trends or challenges in music production - or just share your music on Facebook! Join the conversation with other audio professionals and enthusiasts. Share your production tips and tricks with the ACID community. Discover the world of ACID on Facebook! Join an awesome community to share your music, get inspired and learn about the latest product updates. Sign up today and never miss out on the latest news, information or ACID offers.